We have completed an array of high-resolution simulations of present and future climate over Western North America (WNA) and Eastern North America (ENA) by dynamically downscaling global climate simulations using a regional climate model, RegCM3. The simulations are intended to provide long time series of internally consistent surface and atmospheric variables for use in climate-related research. In addition to providing high-resolution weather and climate data for the past, present, and future, we have developed an integrated data flow and methodology for processing, summarizing, viewing, and delivering the climate datasets to a wide range of potential users. Our simulations were run over 50- and 15-kilometer model grids in an attempt to capture more of the climatic detail associated with processes such as topographic forcing than can be captured by general circulation models (GCMs). The simulations were run using output from four GCMs. All simulations span the present (for example, 1968–1999), common periods of the future (2040–2069), and two simulations continuously cover 2010–2099. The trace gas concentrations in our simulations were the same as those of the GCMs: the IPCC 20th century time series for 1968–1999 and the A2 time series for simulations of the future. We demonstrate that RegCM3 is capable of producing present day annual and seasonal climatologies of air temperature and precipitation that are in good agreement with observations. Important features of the high-resolution climatology of temperature, precipitation, snow water equivalent (SWE), and soil moisture are consistently reproduced in all model runs over WNA and ENA. The simulations provide a potential range of future climate change for selected decades and display common patterns of the direction and magnitude of changes. As expected, there are some model to model differences that limit interpretability and give rise to uncertainties. Here, we provide background information about the GCMs and the RegCM3, a basic evaluation of the model output and examples of simulated future climate. We also provide information needed to access the web applications for visualizing and downloading the data, and give complete metadata that describe the variables in the datasets. 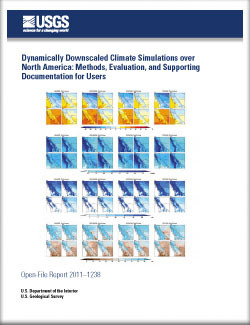 Hostetler, S.W., Alder, J.R., and Allan, A.M., 2011, Dynamically downscaled climate simulations over North America: Methods, evaluation, and supporting documentation for users: U.S. Geological Survey Open-File Report 2011-1238, 64 p.